Tackling difficult soldering applications caused by 'heat sinks' is what this family of American Beauty Resistance Soldering Equipment is all about. However, please be sure to adhere to a 50/50 duty cycle to ensure that excessive heat does not build up in your handpiece cables. For those extra challenging problems, you might want to consider purchasing an extra handpiece and incorporating Handpiece Stacking into your procedure. Description: System Description: This System consists of a Model 105B2 (1100 watt) Power Unit, a Model 10513A Panel Attachment and a Model 10519 Footswitch. Uses: This System can be used to create accurate, trustworthy solder joints in high volume, production applications. It allows for more hands-free operations and is used very extensively in automotive parts rebuilding and salvage operations. Uses include but are not limited to, soldering bus bars, lugs starter and alternator leads, battery cables and similar electrical work. Power Unit Description: The Model 105B2 Power Unit has a low-voltage, high amperage, selectively variable output, isolated transformer. The output voltage is 1.2 – 5.8 VAC (with no load), selectable through a multi-tapped primary switch and three secondary taps. This Power Unit may be adapted to automated and fixtured production tooling. For more detailed information please read the Information/Instruction sheet included with the Power Unit in this Kit. Panel Attachment Description: The Model 10513A Panel Attachment is a stationary, dual carbon electrode device for mounting to the front of the 105B2 Power Unit, using 1/4-20 brass screws in any two of the three output terminals (choose the correct terminals for the desired output). This Panel Attachment accepts Model 10550 (3/8” x 4” (9.5 x 101.6 mm)) carbon electrodes as the standard. For more intricate work, you can also use the smaller diameter, Model 10549 (1/4” x 4” (6.35 x 101.6 mm)) carbons, by using the Model 10538 split-sleeve bushings. For more detailed information please read the Information/Instruction sheet included with the Panel Attachment in this Kit. Footswitch Description:Footswitch Description: The Model 10519 Footswitch is a rugged, industrial switch, (wired normally open), with a six-foot (1.83 m) 18-3 SJT cord and NEMA 5-15 P/R piggyback style plug/receptacle. This footswitch is often used, to better control the cycle time needed for an application. Description: System Description: This System consists of a Model 105C2 (1800 watt) Power Unit, a Model 10587 Industrial, Dual-Carbon, Pliers Handpiece and a Model 10518 Footswitch. Uses: This System can be used to create accurate, trustworthy solder joints in most plumbing, HVAC, large cable work, battery terminals, motor leads and stator applications. Ideal for sweat soldering thin-wall copper tubing up to 1-1/2” diameter. 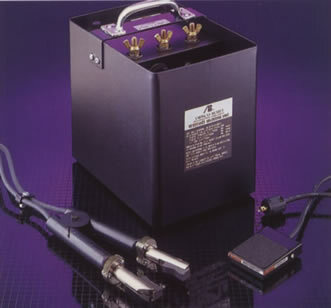 Power Unit Description: The Model 105C2 Power Unit has a low-voltage, high amperage, isolated transformer, with a multi-tapped secondary output. The output power, (500watt – 1300watt – 1800watt) is determined by the two output posts selected, (of the three output posts available). This Power Unit may be adapted to automated and fixtured production tooling. For more detailed information please read the Information/Instruction sheet included with the Power Unit in this Kit. Handpiece Description: The Model 10587 Handpiece is a Heavy-Duty, Pliers style, dual carbon electrode, Handpiece. It is supplied with two 1-1/2” length x 1/2” width x 5/8” height (38.1 x 12.7 x 15.88 mm) concave, carbon block electrodes and a jacking screw for assisting with electrode replacement. These rugged tools feature high-temperature Ultem handles, with through-handle cable connections, for operator comfort. The Handpiece is assembled with Nickel-plated steel heat baffles for cooling and Nickel-plated steel electrode holders for fast efficient heat. Supplied with two ten-foot (3.048 m) high stranded, extra-flexible # 6 AWG cables with ring terminals for sturdy mechanical connection to the 105C2 Power Unit. For more detailed information please read the Information/Instruction sheet included with the Handpiece in this Kit. Footswitch Description: The Model 10518 Footswitch is a rugged, industrial switch, (wired normally open), with a ten-foot, (3.048 m), 18-2 SJO cable and special plug for use with TL type Power Units. This footswitch is often used, to better control the cycle time needed for an application. Description: System Description: This System consists of a Model 105D1 (3000 watt) Power Unit and a Model 10587 Industrial, Dual-Carbon, Pliers Handpiece. Uses: This is our most powerful system and can be used to create accurate, trustworthy solder joints in many Heavy-Duty applications including but not limited to plumbing, HVAC, large cable work, battery terminals, motor lead and stator applications or sweat soldering thin walled copper tubing up to 3”, ( 76.2 mm) outer diameter. It can be used to heat nuts and bolts that are “frozen”, to allow loosening. It can also be used for low temperature brazing applications. 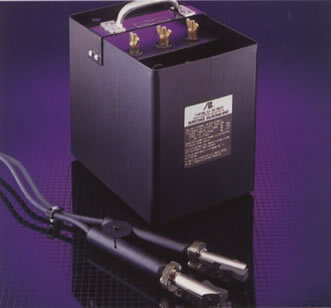 Power Unit Description: The Model 105D1 Power Unit has a low-voltage, high amperage, isolated transformer, with a multi-tapped secondary output. The output power, (1000 watt – 2000 watt – 3000 watt) is determined by the two output posts selected, (of the three output posts available). This Power Unit may be adapted to automated and fixtured production tooling. For more detailed information please read the Information/Instruction sheet included with the Power Unit in this Kit. Handpiece Description: The Model 10587 Handpiece is a Heavy-Duty, Pliers style, dual carbon electrode, Handpiece. It is supplied with two 1-1/2” length x 1/2” width x 5/8” height (38.1 x 12.7 x 15.88 mm) concave, carbon block electrodes and a jacking screw for assisting with electrode replacement. These rugged tools feature high-temperature Ultem handles, with through-handle cable connections, for operator comfort. The Handpiece is assembled with Nickel-plated steel heat baffles for cooling and Nickel-plated steel electrode holders for fast efficient heat. Supplied with two ten-foot (3.048 m) high stranded, extra-flexible # 6 AWG cables with ring terminals for sturdy mechanical connection to the 105D1 Power Unit. For more detailed information please read the Information/Instruction sheet included with the handpiece in this Kit.